Classic Film and TV Café: Memories of Anastasia Romanov and "West Side Story"
Memories of Anastasia Romanov and "West Side Story"
Our month of movie-watching memories continues with a guest post by classic film blogger Jessica Pickens. You can read more reviews by Jessica at her blog Comet Over Hollywood. I’ve always had a slightly obsessive nature when it came to movies I really liked. This tendency first surfaced in the third grade when my family went to see the animated film Anastasia. It is a cartoon about what could have happened to Russian princess Anastasia Romanov after the massacre of the royal family in 1918. I was hooked by the mysterious story and remember floating home that day in November 1997. I listened to my cassette tape soundtrack every day, collected Anastasia memorabilia, became interested in Russian history and somehow thought that I could be the lost princess Anastasia--in short I drove my family crazy. This Romanov obsession continued on and off until the seventh grade. In high school I introduced the movie to a boyfriend who wanted to watch it nearly every time we hung out. After this I got really tired of watching the movie. We take this stroll down memory lane to 1997 as a prelude to what happened when I was 14 years old. In the summer of 2002 I had become more interested in classic film and was devouring Doris Day and Audrey Hepburn films. That spring my dad introduced me to West Side Story, because he thought I would enjoy the musical version of a modern Romeo and Juliet. He later said he created a monster--my West Side Story obsession would rival my previous Anastasia craze. I remember watching the movie awestruck. I thought the dances were amazing (and even tried to learn some) and the music was better than any other musical I had ever seen, though it bugged me that Natalie Wood's singing voice was very obviously dubbed by vocalist Marnie Nixon. Richard Beymer as Tony was extremely attractive to me and it was weird seeing Russ Tamblyn playing a rough gang member when I was used to seeing him as sweet Gideon in Seven Brides for Seven Brothers. Above all, the thing that struck me the most was the ending. I knew it was a story based off Romeo and Juliet but somehow I hoped it had a happy ending, Tony's death was a real shock to me. When the movie ended that night in March 2003, I wondered why Maria had lived and Tony had died. If she had died, maybe they could've been happy in the after-life. Now Maria has to live with her grief. I understand now how much more powerful it is that Maria lives rather than dies. I think it makes her character stronger and proves more of a point with the racism theme that the film covers. 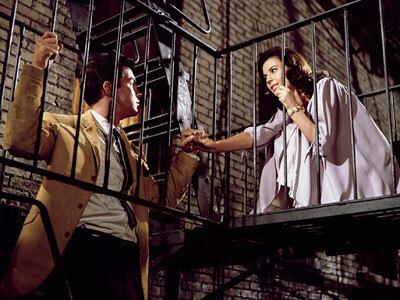 My obsession with West Side Story irritated my family--loving a three hour tear jerker can be tiring for your mother--but it opened up a lot of doors in the classic film world. It is why I have seen 432 musicals to date and it encouraged me to start seeing other classic films. I think part of me was looking for another movie that was as moving as West Side Story--daring all other classic films to have the same impact on me. While Anastasia was the first movie that I really loved, West Side Story made more of an impression on my life and interests. Jessica, it was fun to read about your youthful movie "obsessions"! Growing up in the pre-video era, I had to wait for my faves to show up TV, which meant that my family didn't get to experience multiple viewings of THE ADVENTURES OF ROBIN HOOD, THE WIZARD OF OZ, etc. I can certainly empathize with your love affairs with WEST SIDE STORY and ANASTACIA. I have a tendency to do things in streaks and there was a time when just about every visitor to our abode was forced to watch GREEN FOR DANGER, THE WINSLOW BOY, or any number of movies we have taped off television. Thanks for contributing to this month's theme at the Cafe. I'm with Rick, here. The closest thing I ever got to pre-video repeat viewing was when HBO was in its early days. They lacked content, so they heavily rotated the things they had. It's where I discovered BUGSY MALONE, with Jodie Foster and Scott Baio(!). Jessica, I really enjoyed your post! A good story can truly make an impression on us. The story of "Anastasia" is fascinating. "West Side Story" not only boasts a great story but the music is phenomenal. I also think Robert Wise has one of the most diverse directing resumes, including "Curse of the Cat People," "The House on Telegraph Hill," "The Day the Earth Stood Still," "Executive Suite," "The Sound of Music," "The Andromeda Strain," and "West Side Story." Thank you for sharing your heartfelt memories with us. Nice article! The video I wore out as a kid was the original Willy Wonka and the Chocolate Factory. Fortunately I was an only child so I don't have any siblings who hate me. My parents were awesomely tolerant. Every time I hear Romanoff I think of the Frazier episode where they think they are descendants of the Romanoff family. I hated cartoons as a kid and I still don't watch certain films but I enjoy the Pixar stuff. Your childhood memories are too cute. Thanks for sharing with the rest of us. Hayley Mills Times Two in "The Parent Trap"